The fur coats market is a real challenge nowadays. You don’t always know what you are paying for. There are so many brands that sell their products for a great amount of money, even if their products are not made of high-quality furs. More than this, plenty of them are not the producers. They buy a selection of fur coats and label them under their name. What’s sadder than this, is that many of them are made of animals’ hair mixed with synthetic materials. Anyway, their labels show us they are 100% real. That’s why Vesa fur factory became known in the whole world. We make our own fur coats and sell them under the same name. And we do it good. There are people from the entire world who love our products. The high-quality we always maintain, the modern models we design and the attention we dedicate to every detail – these are the secrets of the Vesa fur factory’s success. We started this business in Romania. We opened stores in every corner of the country. From Arad to Galati. From Bucharest to Constanta. Everybody was curious about what Vesa fur factory was able to do. Our sellings were growing day by day and our heart was melting due to all the kind words we were hearing about us. But everything took a new dimension when we became known in the whole world. We sell our fur coats worldwide and we are so happy to see we can give our clients a reason to smile. That’s why almost four years ago A&A Vesa fur coats decided to launch the international website, particularly created for stakeholders around the world. At the moment, Vesa fur factory is still growing. We have our own tannery that has a capacity of 500 skins per day. This means that we can produce up to 300 garments per month. Knowing that the making of a fur coat can last up to 10 days, this means a lot! Vesa fur factory is designing for you a complete line of fur products such as fur coats and vests, sheepskin coats and jackets, shearling coats and jackets, decorations and accessories. All the real fur coats we make are hand-made. We sew our luxury garments with great attention to every detail, so we can always maintain the high-quality that made us popular in the whole world. All the process starts with salting, after plucking the lamb. 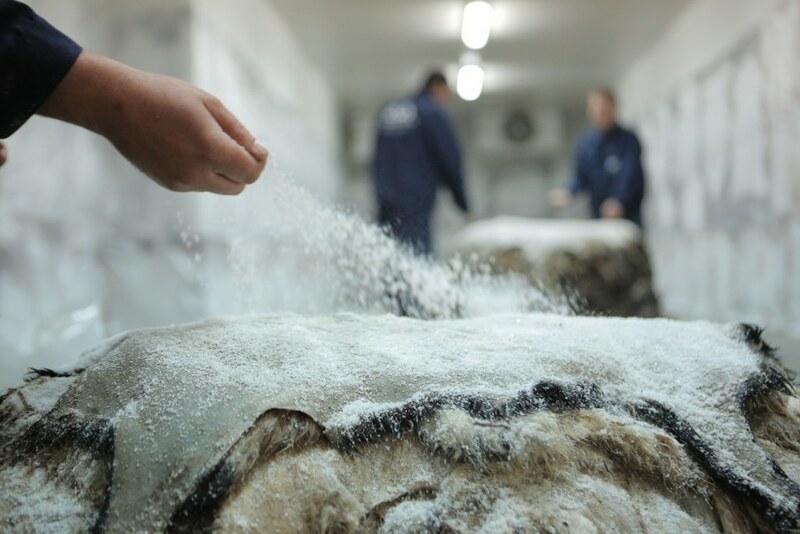 The Vesa fur coats factory team sprinkle salt on the leather, to remain fresh. The steps of the process of tanning and leather-tanning are soaking, washing, degreasing, removing impurities and grease off the leather surface. Tanned skins enter into a manufacturing process: stretching, trimming, ironing, finishing, dying. Processed skins can be used as ornamental or they can be painted and used for manufacturing of leather products and fur clothes. The more common sources for natural fur clothing and fur-trimmed accessories come from: lamb, fox, raccoon, and mink. We hope you enjoy everything that Vesa fur factory is creating. Keep in touch with our website and don’t miss all the real fur coats we are preparing for you!